As part of the “Backstage at the Lincoln” music series, the Lincoln Theatre welcomes singer/songwriter Enrique Infante with his band “Dejavu” this Thursday, March 28th at 7pm. The Backstage at the Lincoln concert series offers you the extraordinary opportunity to be seated on stage for a performance with your favorite local artist. Set against the hand-painted grandeur of the Lincoln’s Egyptian Revival-style motif, enjoy an exceptionally intimate concert from a perspective normally seen only by the artists themselves. 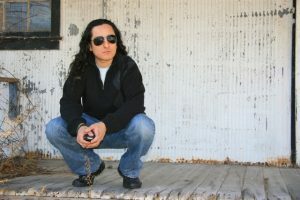 In 2004, Peruvian singer, songwriter, producer, and multi-instrumentalist Enrique Infante formed the Latin fusion rhythms band Dejavu, leading to the release of his first album, Abriendo Caminos (Opening Paths), on November 11, 2006. Over the next few years, Infante was dedicated to promoting his music, performing in the US, México, and Peru. In 2010, he received el Premio Orgullo Peruano (Peruvian Pride Award) for his success as a Peruvian artist. Infante’s song “Colors of Columbus” was selected as one of the winners in the 200 Columbus Song Contest held in celebration of the city’s bicentennial. On May 5, 2012, he released his second album, Canciones Ajenas (Other People’s Songs). Infante has been a member of the American Society of Composers, Authors, and Publishers (ASCAP) since 2007. He is also a member of NARAS (National Academy of Recording Arts & Sciences) and LARAS (Latin Academy of Recording Arts & Sciences) which produces the Grammy and the Latin Grammy Awards.